Our streets, sidewalks, bikeways and transit lines do more than connect people with where they're going - they connect people to each other. I believe our public spaces should be welcoming and inviting to all people, and are instrumental in creating vibrant communities. My job at Alta is to help people connect with active transportation options and enjoy the many benefits that come with it. Anna has devoted her career to promoting active transportation since 2010. 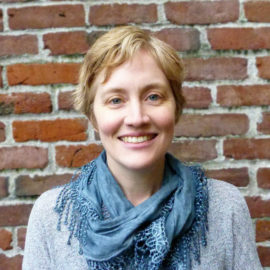 She graduated from the University of Georgia with a Master of Environmental Planning and Design, emphasizing bicycle planning in her studies and research. Anna is a League Cycling Instructor (LCI) with the League of American Bicyclists. Prior to joining Alta’s Program Team, Anna was the Membership and Business Program Manager at the San Francisco Bicycle Coalition.